We take strands of polyethylene and twist them together, by twisting the fibers they form a strong round strand. Those strands are then tied together. The combinination of the round strands and the bumpy knots prevents the ball from scraping along the cage causing massive wear. We start with high density polyethylene and then treat it to protect it from the elements. The combination of polyethylene's characteristics and the features of the other molecules make sure your net will not fade, stretch, or otherwise become damaged by the elements and time. By having a full rope border you don't just have a better looking cage, you have a stronger, more durable cage. 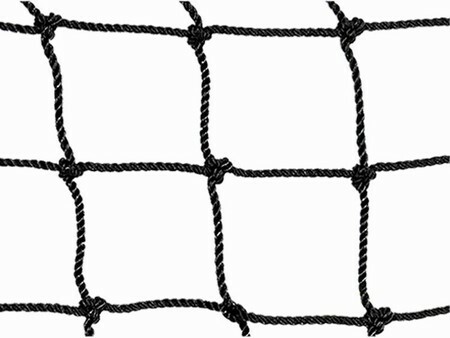 The ropes provide reinforced points to secure your net to it's frame. The rope borders also help to shape your cage and keep it looking professional. Our batting cages are fully bordered on every side and even have an extra support down the middle to reduce sag. With 5 long tie ropes on each end you can minimize the sag in the net and create a professional looking batting cage. With 5 places on each side, you have full control over the batting cage, so you can get it just right. Entry doors make everyday use of your batting cage easier. No crawling under the net, or leaving your net unsecured so you can get in and out. Action Sports is committed to providing quality, affordable products, service and support you need to help your game reach the next level. We value each of our customers and offer everyone the same high level of service. Word of mouth has grown our customer base that includes individuals and professionals., and about everything in between. They all have different needs, but they have one thing in common - when they have questions or special needs, they turn to our experts for answers they can trust and equipment that they can rely on.